This week's disclosure of a nuclear tie between Israel and South Africa, as Sacha Polakow-Suransky’s The Unspoken Alliance: Israel’s Secret Relationship with Apartheid South Africa, would have it, is nothing new. That hasn't stopped some from called the revelation "ground-breaking" and proclaiming with no uncertainty that Israel's nuclear program has, at long last, been revealed. Rumours and allegations that Israel assisted South Africa's nuclear program have been floating around since the late 1970's. It was widely believed that a mysterious flash in August 1979 was a joint Israel-South Africa nuclear test. Further flashes were reported near South Africa on September 22, 1979 and December 16, 1980. Yitzchak Rabin, Prime Minister at the time, responded to the allegations then by saying, "There is not a grain of truth in the reports about nuclear cooperation with South Africa." What is new is several declassified South African documents that Polakow-Suransky provides as proof that nukes were offered. The documents show that Shimon Peres (1923 - ), then Israel's Defense Minister met with P.W. Botha in 1975 to discuss a possible sale of Jericho missiles. 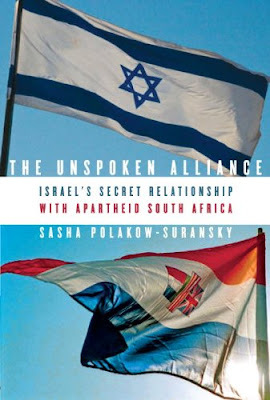 Polakow-Suransky claims that the South Africans also believed that Israel would fit the missiles with nuclear warheads. While not denying that the two men met to discuss conventional weapons, Shimon Peres, now Israel's President, has vehemently denied that nuclear weapons were offered. Former South African President F.W. De Klerk has called the allegations "simply ludicrous." De Klerk has flatly denied the story, saying, "I have no reason to question the information that was consistently conveyed to me by the relevant authorities that South Africa developed nuclear weapons on its own." But what of the allegations? To really understand the complex rapport between Israel and apartheid South Africa, we need to go back and consider the context of mid-century realpolitik and international relations. Long before allegations of cooperation began to circulate, South Africa was already pursuing its own nuclear agenda. By 1961 (two years before Israel's Dimona facility was activated) construction of SAFARI (SA Fundamental Atomic Research Installation), a nuclear research facility, had begun in Pelindaba with assistance from the US, France and West Germany. The Americans were also supplying enriched uranium to run the reactor. Despite protests from some American quarters that Pretoria could utilize the enriched uranium for military purposes, the IAEA permitted a second reactor in Pelindaba, called SAFARI II. South Africa was also able to contract for the construction of two large nuclear power reactors with France (these two facilities didn't become operational until 1984 and 1985). 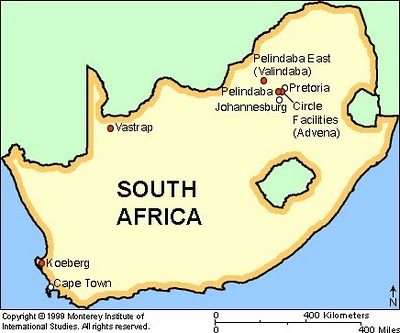 In 1970 South Africa announced that it had successfully achieved enriched (but not weapons-grade) uranium production on its own, and expressed an interest in "peaceful nuclear explosives" (PNE). According to Al J. Venter, author of How South Africa Built Six Atom Bombs (2008), Prime Minister John Vorster, in 1974, "approved the development of a limited nuclear explosive capability and the construction of an underground test site" at Vastrap, north of Upington. In 1975 work began on the two test shafts in the Kalahari Desert. The first nuclear device was completed in 1977. In July 1977 both the USSR and the US (which according to some sources had been informed beforehand of the test) accused South Africa of preparing to detonate a device in the Kalahari desert. In a letter to President Carter, South Africa President Vorster pledged that "South Africa does not have nor does it intend to develop a nuclear explosive device... there will...not be nuclear testing of any kind in South Africa." 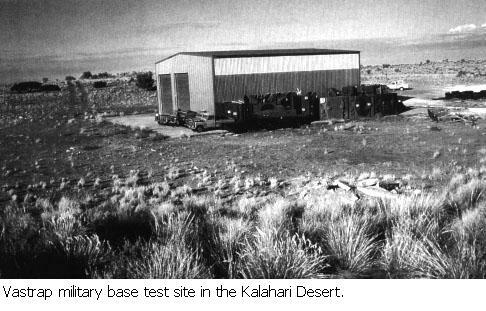 The Kalahari test never happened. But two years later, on 22 September 1979, a mysterious flash, similar to those seen during French and Chinese nuclear tests, was spotted over the south Atlantic Ocean near South Africa by a US VELA reconnaissance satellite. A commission established by President Carter concluded that the flash "was probably not from a nuclear explosion. Although we cannot rule out that this signal was of nuclear origin." 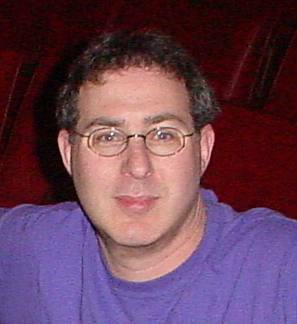 But security agencies, in particular the CIA, were convinced that a joint Israel-South Africa nuclear test took place. Former President F.W. De Klerk has confirmed that South Africa had produced six bombs during this period but says they were voluntarily destroyed in the early 1990's. According to the historical record, then, regardless of a meeting between South African and Israeli representatives, in 1975, when P.W. Botha and Shimon Peres met, South Africa was well on her way to testing an operational nuclear device. This was also a period in which South Africa was feeling increasingly threatened by her African neighbours. In 1970 the International Court of Justice declared that South Africa's Mandate over Namibia, which it had held since the end of the First World War, was illegal. South Africa was particularly concerned with the influx of tens of thousands of Cuban troops and Soviet advisers into Angola who were intervening on behalf of Angola's Communist Popular Movement for the Liberation of Angola - Party of Labour. South Africa, meanwhile, moved troops into Angola (Operation Savannah) to assist the pro-Western National Front for the Liberation of Angola. NFLA was receiving financial support from South Africa, the US and Israel, which also provided training and arms during the 1970's. Around the same time, The Organization of African Unity (OAU) began to push the international community for sanctions against South Africa, specifically an arms embargo. A voluntary embargo, observed by the US and the United Kingdom, had been in place since the early 1960's. France had seized the opportunity to become South Africa's most important arms supplier; undoubtedly, Charles De Gaulle was also interested in obtaining South African uranium for France's own nuclear program. In 1970 UN Security Council Resolution 232, a non-binding resolution, called "upon all States to strengthen the arms embargo." The US, France and the UK, all of whom had close economic ties to SA, abstained. In the face of growing Soviet influence throughout Africa, the US was keen to push South Africa into anti-Communist interventionism. Despite the voluntary arms embargo, in 1975 the US would have likely given a sale of arms to Pretoria its blessing. However, rising internal strife in South Africa a year later forced major powers to reconsider military and other economic agreements. From June to December 1976, a number of major protests, known as the Soweto riots, erupted in several major centers resulting in hundreds of deaths and thousands of arrests. France publicly announced that no new military contracts would be signed with the apartheid state. Several previous contracts were cancelled. West Germany, which had been supplying South Africa with experts and technical know-how also ended nuclear cooperation in 1976 (although production continued). In 1976 the OAU condemned France for its sale of nuclear technology to South Africa. It was in this atmosphere of increasing conflict both within and outside South Africa, and in light of a tightening international arms embargo, that South Africa and Israel were undeniably pushed toward a closer military relationship. South Africa needed weapons and Israel, just two years after the Yom Kippur War, was desperate for money. A reluctant alliance was struck. To his credit, author Polakow-Suransky correctly concedes (in an interview at Middle East Analysis) a wide range of ideological thought by Israel politicians. "[T]he founding fathers and mothers of the nation who were not just queasy but outright opposed and viciously critical of apartheid. These people spoke out against it, they allied with black African states," says Polakow-Suransky. But others, including Shimon Peres, "were willing to make moral compromises that the previous generation wasn't willing to make. It was strict realpolitik." In truth, while celebrated in the military establishment, in 1975, neither Sharon nor Raphael were in any position to influence government policy. 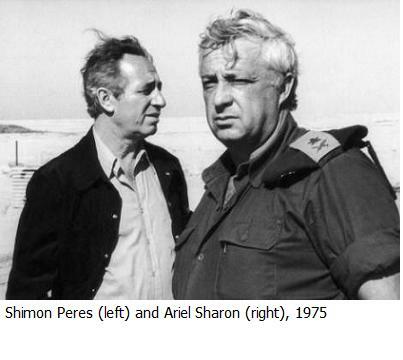 After the near-disaster of the October War, a new government was established with Yitchak Rabin, a former Ambassador to the US and Chief of Staff, as the new Prime Minister and Shimon Peres, a former protégé of Ben-Gurion who had held a variety of cabinet positions, the Minister of Defense. Eitan was occupied with reorganizing the army in the North; Sharon had been elected to the Knesset in January 1974, but resigned in December of that year and returned to his farm in the Negev. Posted by Morey Altman at 5/27/2010 04:12:00 p.m.